The Daily Bruin is the student newspaper at the University of California, Los Angeles. Founded in 1919, it is one of the largest student organizations on campus, consisting of more than 400 staffers across 13 departments: news writing, sports writing, arts & entertainment writing, opinion writing, news radio, graphics reporting, blogging, online/web development, video journalism, copy editing, photojournalism, page design, and cartoon and illustration. Welcome to the Daily Bruin Spring 2019 application period! You have until the end of Week 2 to complete your application to one of the premier student newspapers in the country. Can you apply to multiple sections? No. This is a change from recent application periods, but you are only allowed to apply to one section of the Daily Bruin. If you create multiple applications, they will all be denied. When will intern training happen? Intern training will be the weekends after Week 3 and 4. but the editors will alert you to more specifics during the hiring process. Required media law training will be announced at a later time. These are all required and your acceptance to the organization is contingent upon attendance. Can you work for both student government and the Daily Bruin? Essentially, no, unless you’re applying as an Opinion columnist or a blogger. This limitation is to comply with the Daily Bruin's policies for conflicts of interest. You may apply to the Daily Bruin and student government, but you must choose between the two if you’re accepted into both. These policies are less strict about becoming a member of a political group, with the main restriction being against holding a leadership position. However, outright displays of partisanship – attending a public event with the Bruin Republicans or posting on your Facebook page about your support for the Democratic presidential candidate – are also prohibited unless you are a columnist. OVERVIEW It is more important than ever to become literate in news media. According to the Pew Research Center, the gap between TV and online news consumption continues to narrow. The portion of Americans who generally get news from TV is declining, while the portion of Americans getting news online is growing. Vice Media went from a start-up to a $5.7 billion global juggernaut. Bloggers will write for the Quad, the Daily Bruin's space for analytical and explanatory journalism, similar to publications like Vox, Slate or the New York Time's "The Upshot" blog. The Quad covers a wide range of topics — just this summer, we've published one story about the science behind California's worsening wildfires and another about how to make the transition from dorm life to apartments — the possibilities are really endless! Graphics is a multimedia section within the Daily Bruin that creates compelling and comprehensive visual aids that correspond to a story. We also create standalone graphics which are entirely produced within our section, from conception to completion of the graphic. Illustration interns are responsible for creating artwork that supplement articles published in the Daily Bruin newspaper. 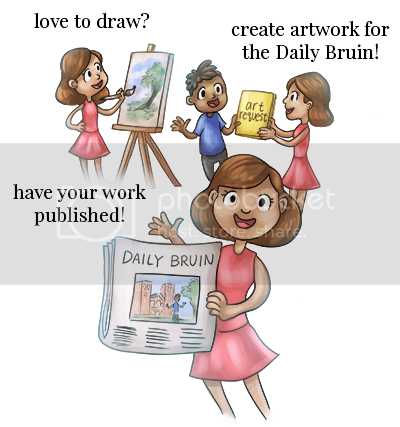 As members of the multimedia section, illustrators are tasked with receiving art requests from the paper’s written sections of news, sports, opinion, arts and entertainment, and Quad, the Daily Bruin’s online blog. Illustrators also contribute to the paper’s quarterly arts magazine, PRIME, and collaborate with other departments on both larger ventures and smaller projects, such as web headers and layouts or merchandise. We welcome creative artists from all majors who have a passion for art and experience with creating works in either traditional or digital media. Copy editors are the watchdogs of the paper. We edit every article that goes in print and on the website to make sure that it follows the rules of grammar, Associated Press style, coherency, factual accuracy and consistency. Copy is ultimately responsible for sending a clean, consistent and complete paper to the printer by deadline. We want to help reporters present their stories in the best possible way, which means working with all the sections of the paper. Photography Interns are involved in capturing events that happen at UCLA and the Los Angeles area. Interns gain hands-on experience. No camera is required nor experience as we guide all new interns both with gear and other programs used to edit photos. As a photojournalist, assignments vary widely from sports to concert photography. Working as a photojournalist will grant valuable work experiences and better your photography portfolio. The Design department is responsible for arranging the layout of stories and art for every issue in the Daily Bruin. We are also in the process of expanding the department's reach into the realm of web design. A data journalism intern is the most cross-disciplinary entry position at the Daily Bruin. Interns receive training in traditional reporting skills, statistical analysis and web development and are expected to pitch and contribute words, graphics and code to The Stack, Daily Bruin's data journalism blog.